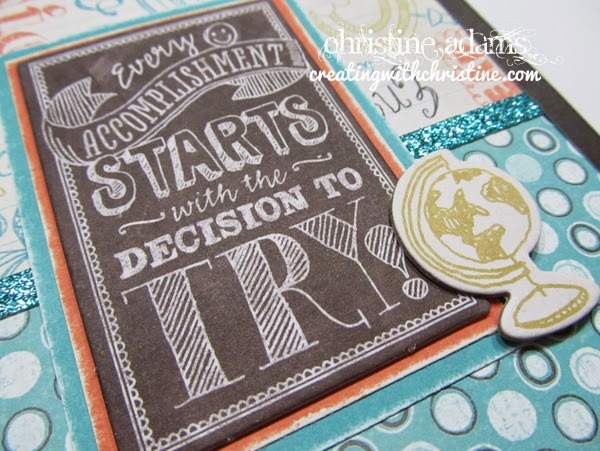 Creating with Christine: Chalk It Up Club Layouts! This month my club members will be receiving little gift bags from me with a gift inside as a THANK YOU for being in my club!! I love these ladies so much and look forward to spending time with them every month!! This month we will be working on our Skylark kits, but we will be ordering kits for next month's project - CHALK IT UP! These layouts are PERFECT for school, but if you don't need school layouts, you can simply change the title! I used our Imagine Book for the patterns for both of these layouts! The title says "This is going to be a wonderful Year" - which could apply to retirement, or birthday, or starting a new job, or family or ANYTHING! On the other page, the sentiment reads "Every accomplishment starts with the decision to try". Again, this can apply to almost anything! How about achieving a goal like losing weight, training for a marathon, learning a new hobby or skill, or competing in show choir or dance, etc. 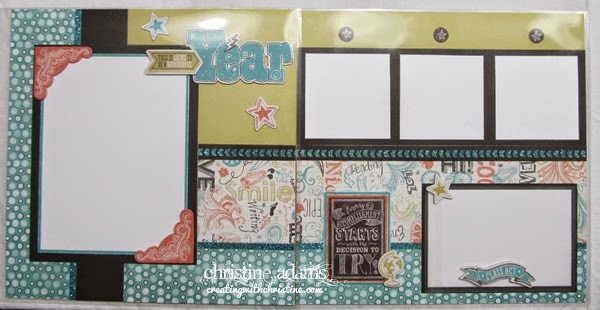 The bottom right hand side of the layout features a 4x6 flip flap so that you can add as many additional photos and journaling as you like! 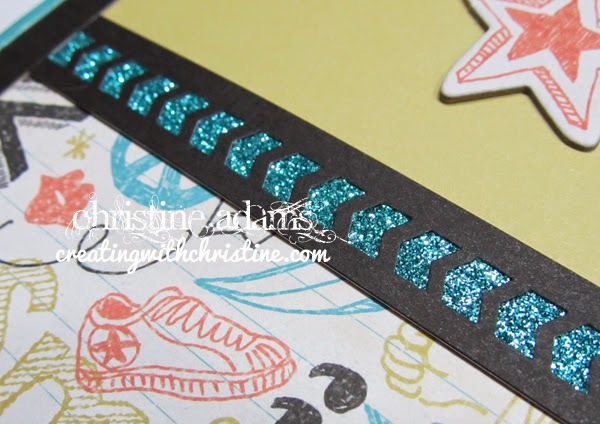 This layout also features our new Chevron Border Punch backed with our new Teal Glitter paper. I LOVE the 3 teal shades included in this pack!! The second layout can also be used for any occasion! 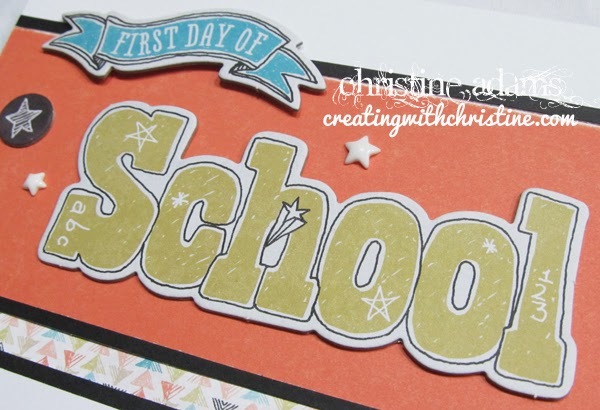 The title reads "First Day Of School" but you can change it to "first day of _________" anything! Or leave off the first day and call it Beach Vacation! The colors will certainly go perfectly with beach photos! The sentiment on the other side reads "Today is a great day to learn something new" - again, this can apply to so many things beyond school - how about "teaching an old dog new tricks" - literally a layout about taking your dog to obedience training! See what I mean? You can do so much more than just school with these layouts! I used Liquid Glass on the glass lenses and our Black Sparkle Flourishes on this layout along with our new White Enamel Stars! 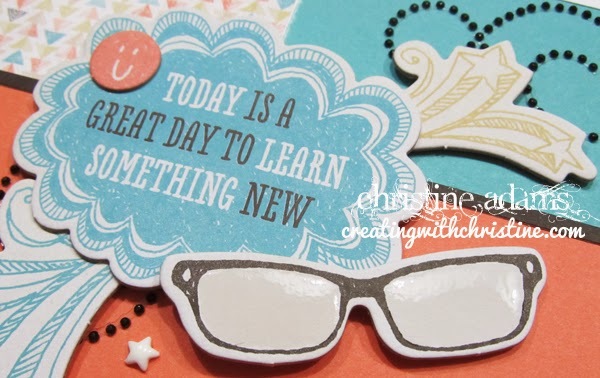 The basic kit is $15 and includes the Chalk It Up Paper Pack and Dimensional Elements. *I didn't end up using this adorable assortment for these layouts, but I highly recommend them! You can easily accent your photos with these little puffy stickers! Would you like to join us in making these layouts next month? Contact me today so that I can order your kit for you. I promise you will have fun and learn something new each month!